This blog bring to you the latest news about smart grid producers and final consumers for easy understanding of this new technology. 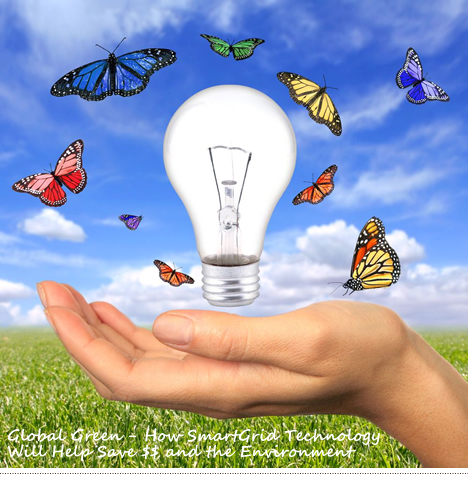 Smart Grid is a sustainable energy system that measure, check, and control the generation, transmission, and consumption of electrical energy in grids on all voltage levels. Smart Grid experts are not only driving forward the development of effective communication and information technologies for the build-up of intelligent power supply networks, solutions are already being applied right now on various products. Examples of these are control systems for the realization of virtual power plants, intelligent consumer data acquisition systems, and smart distribution management systems. GridPoint says it has scored a deal to provide its energy management system to potentially 2,250 United States Postal Service locations in the U.S. USPS (United States Postal Service) needs all the help it can get when it comes to reducing costs, and has been working on reducing energy use in its facilities by 30 percent by 2015. Using GridPoint’s energy management tools, USPS will be able to track, monitor and manage the energy consumption in its buildings. Buying up energy management players has become a bit of a trend for the larger smart grid infrastructure companies. Wireless network player Silver Spring Networks acquired Greenbox, and demand response company EnerNOC has bought up five various energy management startups. For GridPoint, and these other smart grid firms, a contract like the one with USPS is a solid win. The organization has thousands of locations across the U.S., which means more sales, but also an interesting test bed to pilot the system at similar sites but with different geographies (energy consumption trends can be very regional). USPS has also been experimenting with green cars, and Bright Automotive, which makes a plug-in hybrid car called the IDEA, has a contract to retrofit a standard postal service fleet vehicle with its electric drive train and test the vehicle in Washington, D.C., for a year. Smart Grid is revolutionizing the electric utility industry, transforming today’s aging electric grid into a dynamic, optimized Smart Grid that is better suited to meet client demand and the challenges of today’s economic and political climate. Attend this symposium for actionable information and deep insights into how Smart Grid is transforming everything in our industry. This event is from May 23 to May26th at Indiana Convention Center , IN. Smart Grid will be bigger than the Internet? There a number of strong parallels between the arc of information technology and the current trajectory of the smart grid. While cause and effect are debatable, the fact is that a lot of the people driving changes in the clean tech world have IT backgrounds. It may be true that to the man with a hammer, the entire world looks like a nail. Disclosure: This is what we are trying to do at EcoFactor. We use the Internet to help consumers automatically manage their home energy use through a SaaS (software as a service) platform. Our industry experience has given us a front-row seat for both the historical revolution in IT and the impending one in the smart grid, and we see some specific parallels between the two. We’re not alone, but many trends in clean tech really do look a lot like the IT revolution. Remember CompuServe? Prodigy? AOL? At the dawn of what became the Internet, their “walled gardens” defined the online experience for millions of users. Today, the idea that your service provider told you what you could do with your connection seems quaint. We see a number of efforts now to fence in the smart grid — to define and limit what can be done and who can do it. But just as the World Wide Web made such finger-in-the-dyke efforts futile last time, the Internet ‘s furious pace of innovation will again overwhelm those kinds of defenses. The smart grid will enable automated energy management, automated dynamic price response, and a host of innovations we can’t yet imagine. It will reward companies that find innovative ways of leveraging diverse data sources, devices and technologies. And if those applications aren’t welcomed inside the walled gardens, the applications will simply route around them. Ironically, these Internet-based products won’t just benefit consumers, they will benefit utilities, energy retailers, and home service providers, too. Terabytes of new data will offer grid managers greatly increased visibility into demand — and not just yesterday’s, but tomorrow’s — all the way down to the individual home level. At the beginning of the PC revolution, early adopters bought Osbornes and KayPros and Apple IIs because they were innovative and cool. But those users had to put up with awkward interfaces and the need for considerable effort and expertise to keep them running. As long as even basic word processing required a mastery of command line syntax, there could be no mainstream consumer adoption of PCs. Getting past that barrier required both improved technology and a shift in philosophy: market growth means insulating consumers from the bits and bytes. It also means offering new applications (like browsers) that effectively leverage the connected world. Many consumer-facing smart grid offerings today are, in effect, all about the bits and bytes. Home energy dashboards and reporting tools ask customers to know, care about and pay attention to the details of their energy consumption, but provide no easy way for consumers to take action and benefit from them. DR solutions ask consumers to accept discomfort in order to address grid-level problems like peak demand. Today, new solutions allow consumers to maintain complete control over the temperature in their homes and achieve significant cost savings without ever thinking about therms or kilowatt hours or setback schedules — from any device, or automatically, and with no device at all. Just as the iPod and iTunes let users focus on the music, the winning smart grid applications will let users focus on the results, not the process. Most early PC makers — Kaypro, Osborne, Apple — were just PC makers. As long as it looked like a not-ready-for-prime-time niche market, the giants in adjacent industries stayed on the sidelines. Just as IBM’s entrance into the PC market took that industry to the next phase of its evolution, today’s IT giants like Microsoft, Google, and Cisco are indicating their own perception that the smart grid market is ready to sustain the behemoths. In a sense, they have brought us to the end of the beginning of the smart grid. As with the PC revolution, the presence of these blue chip companies legitimizes the industry for potential customers, and that legitimacy benefits not just the blue chip players, but competitors large and small. That said, the fact that the grid gains from Google’s entrance does not necessarily mean that the opposite is also true. Mainframe giant IBM could not translate that strength into long-term dominance of the PC market; there is no guarantee that the IT giants will dominate the smart grid. But their presence will almost certainly propel it forward. The Internet, the growing importance of the user experience, and the entrance of large tech companies should all be seen as good omens for the future of the smart grid. These trends will lead to better products and services, which will in turn drive consumer adoption. And consumer adoption will be the key to fulfilling the environmental and economic potential of the smart grid. 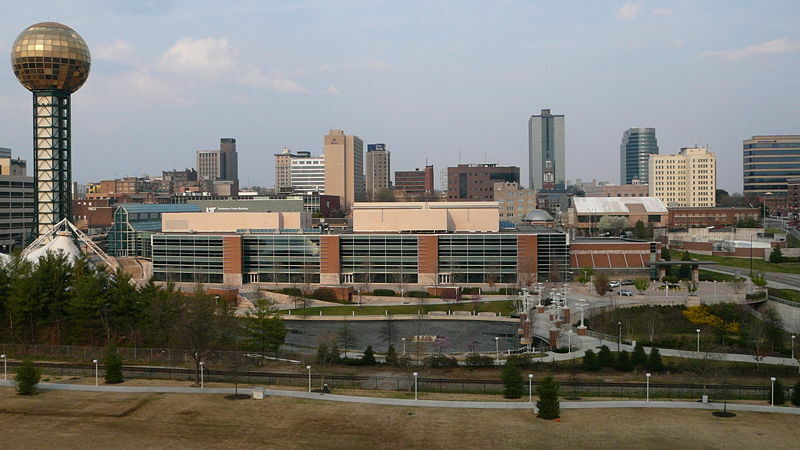 Knoxville Utilities Board (KUB), an electric, gas, water and wastewater service provider, will upgrade and enhance its existing network infrastructure with smart grid technology from Intergraph. With the Intergraph Smart Grid Operations Command-and-Control Center, KUB will consolidate and streamline network operations, leading to increased accuracy, efficiency and reliability. The new smart grid solution will integrate Intergraph outage management system (OMS) and mobile workforce management (MWFM) technology with SCADA and alarm functionality to simplify the presentation of complex data and improve situational awareness for grid operators. It will be used to manage and control the electric distribution network, as well as dispatch work orders for the utility’s natural gas and water systems. In addition to integrating SCADA and alarm functionality into its grid, KUB will also work with Intergraph to develop a wall board display of its full electric distribution system that will dynamically depict outage information and additional network data. By incorporating all of these functions into a single user interface, KUB’s system operators will no longer have to rely on multiple displays to accomplish their tasks and keep the network up and running. The system will also prevent information overload during major storm situations. Further information can be found at Intergraph website and KUB website. The “smart” electric grid may be just a little too smart. Once a smart meter is attached to a home, it can gather a lot more data than just how much electricity a family uses. It can tell how many people live in the house, when they get up, when they go to sleep and when they aren’t home. It can tell how many showers they take and loads of laundry they do. How often they use the microwave. How much television they watch and what kind of TV they watch it on. Almost 200,000 smart meters are now being installed between Fort Collins and Pueblo, and across the country 52 million smart meters will be installed by 2015, according to a Federal Energy Regulatory Commission estimate. 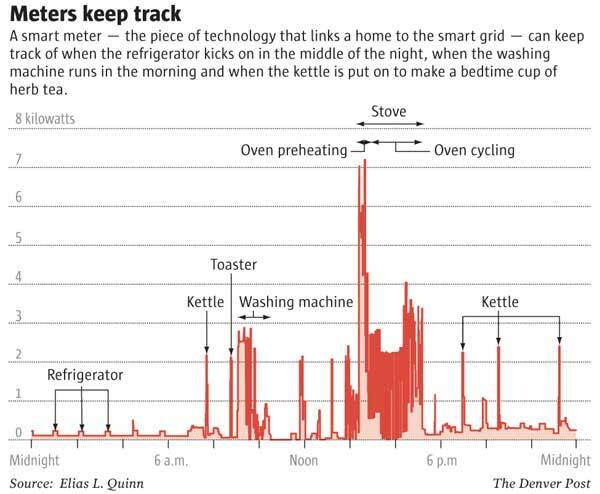 “This is technology that can pierce the blinds,” said Elias Quinn, author of a smart grid privacy study for the Colorado Public Utilities Commission. “Insufficient oversight could lead to an unprecedented invasion of consumer privacy,” Quinn warned in his report to the PUC. Law enforcement, government agencies and corporations, such as Microsoft and Google, already are eyeing all that data. The transformation of the electric grid into a smart, sophisticated two-way energy and communication system is seen as a way to better manage power and improve efficiency. The federal government has put up $3.4 billion to help speed smart-grid development. The technology, however, poses new questions for consumer and privacy advocates, state regulators and federal officials. How do you protect the information? Who should have access, and what happens if it falls into the wrong hands? “Privacy and cybersecurity are among the greatest challenges in implementing the smart grid,” said Nick Sinai, energy and environment director at the Federal Communications Commission. Federal agencies and some states — including Colorado and California — are now moving to deal with privacy and security risks posed by the smart grid. The Colorado PUC opened a docket in August to gather comments on whether the state rules governing privacy are sufficient. The commission is reviewing the testimony to decide whether further action is necessary, said PUC spokesman Terry Bote. New rules are needed, said Bill Levis, director of the Colorado Office of Consumer Counsel. Sinai said one lesson from the Internet is that it is cheaper and more effective to build in privacy and security protections at the start. In the meantime, utilities continue to install smart meters. Xcel is installing 23,000 smart meters in Boulder as part of its SmartGridCity pilot, according to company officials. By the end of this year, all 96,000 Colorado homes and businesses served by Black Hills Energy will have smart meters, with the help of a $6.1 million federal grant. Fort Collins has plans to install 79,000 smart meters with the help of $18.1 million in federal funds. Colorado utilities, executives say, have been collecting and protecting customer data for years. “The level of data we receive with the smart grid may change, but the privacy principle remains very much the same — specific data stays between us and the customer,” said Megan Hertzler, director of data privacy for Xcel Energy. Still, Xcel is “getting a lot more requests for customer usage information now that it is seen as more desirable,” Hertzler said. Most of the inquiries are from companies that want the information for marketing. Xcel has not released any of the data, executives said, and declined to name the companies making the requests. The key differences between the meter on the side of most houses now and the smart meter deal with time and communication. 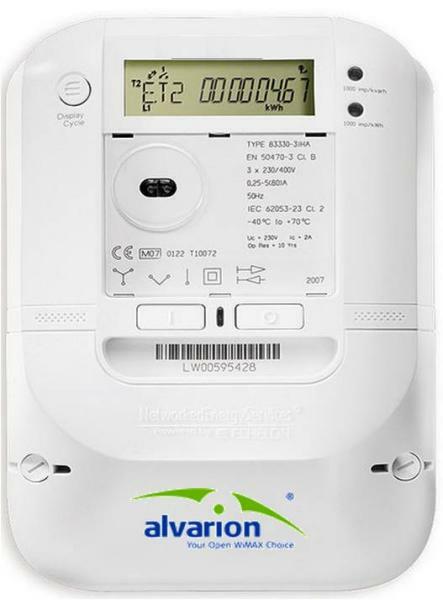 Meters are currently read once a month; smart meters take readings every 15 minutes. Future models may take readings every six to eight seconds. And all that information doesn’t wait for a meter reader. It is instantaneously communicated to the utility by fiber-optic cable, broadband or Wi-Fi. The world’s leading provider of 4G WiMAX and wireless broadband solutions, is showcasing its best-of-breed award-winning 4G WiMAX infrastructure and optimized smart grid connectivity solutions at UTC Telecom 2010 May 23 — 26 in Indianapolis. Alvarion will highlight its market leading 4G WiMAX technology which ensures low latency, QoS, scalable, real-time and secure broadband communication for mission critical grid devices. Alvarion Smart Grid Session: Alvarion’s Eedo Liftshitz, director business development, will be part of a session discussing “4G WiMAX for the smart grid — why WiMAX?” being moderated by Monica Paolina, from Senza Fili. This session will take place on Monday, May 24 from 4:30 to 5:45 p.m. in Room 108 and will focus on the smart grid solution implementation, specifically addressing wireless architecture, communications infrastructure and end-to-end system integration. The panel will also include vendor experts on smart meters, distribution automation, smart meter aggregation and end-to-end system integration to provide the perspective of the entire ecosystem. Alvarion will also participate in a panel discussion on Tuesday, May 25 from 3:00 — 4:15 p.m. in room 104 titled “4G emerging technologies — what’s right for you? 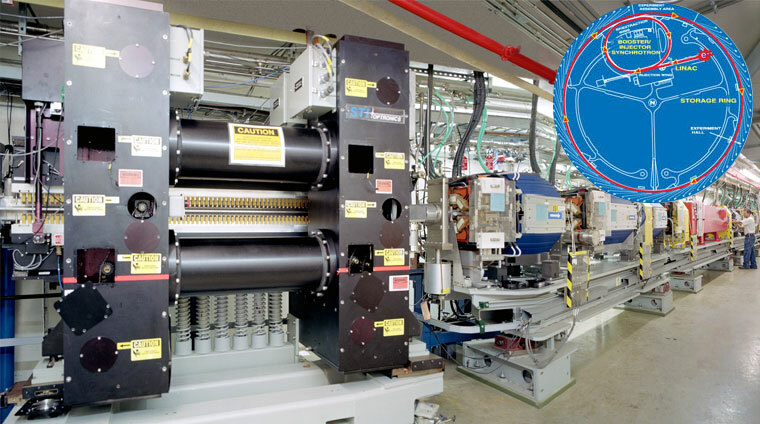 – Part 2.” This panel discussion, hosted by Ashish Sharma, vice president of marketing for Alvarion, will provide an opportunity to ask questions about the next generation technologies from equipment manufacturers, carriers and utilities. Alvarion’s broad portfolio of wireless solutions is ideally suited to build the next generation smart grid infrastructure. The industry leading portfolio includes WiMAX products for licensed, license-exempt, and 3.65 GHz quasi-licensed frequencies, point-to-point and point-to-multipoint license-exempt broadband wireless products, license-exempt backhaul products and a variety of end user devices for fixed and mobile services. Alvarion’s all IP solutions provide advanced features such as low latency, enhanced coverage and capacity, enhanced security based on standardized WiMAX protocol and quality of service. Because of the all IP nature, these solutions can be easily scaled and result in a very quick network rollout. The paradigm of the “smart grid” has been embraced eagerly by everyone from staid old utilities to Silicon Valley venture capitalists, from startups and industrial giants to the Department of Energy, with its generous stimulus grants for the development. Why not? Who wouldn’t want to go from the ostensible dumb grid to a smart one? Easy sell. Big opportunities for everyone in a transformative electric network: for consumers to make smarter energy decisions, vendors to sell smart hardware and software, utilities to optimize their assets and get green “cred,” and of course, for investors to facilitate and benefit from both real and frothy growth. Win-win all around. Bigger, greener, better, smarter. So will the electric grid come to resemble the architecture of the Internet’s pervasive communications grid? It can and it will, but not entirely for the reasons proffered by smart grid cognoscenti. You need to know just two things–two macro trends–to know why the smart grid is coming, and will be a big secular trend. 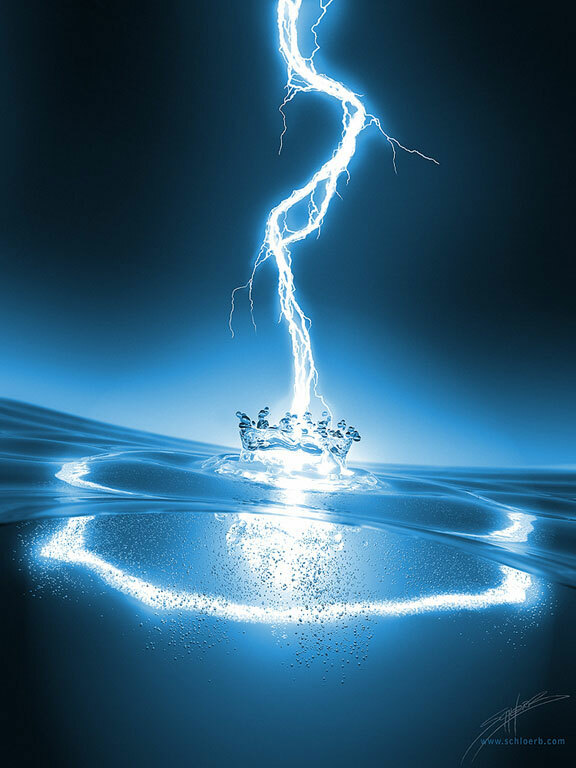 First is the rising use of electricity and collateral radical increase in its importance. Second are the technologies to make the grid smarter have come of age, and just in time. First, the demand. More than 70% of U.S. energy is used for non-transportation purposes, with the majority (60%) of all non-transport needs being met with electrons. The use of energy in the form of electricity (measured in “barrels of oil equivalent” per year) has risen 75% in the past 30 years. The Energy Information Administration forecasts the trend continuing for another 30 years. Energy used for all other purposes (again, excluding cars, planes and trains, which for context use about 5 BBOE per year) has been essentially flat for three decades and will stay essentially flat, even as the U.S. economy has grown, and is forecast to grow. Global spending on electric transport (transmission and distribution infrastructure) already runs about $100 billion annually, with the U.S. accounting for 20% of that market. It’s an easy bet on this macro; a lot more money will be spent on electric grids. That’s pretty much all you need to know to bet on this sector, but there’s more. Add to this trend the imperative to achieve more efficiency from the electric system, reliably and securely. This can only come from adding more smarts to the grid. Growth will be proportionally faster on new technologies to add smarts to the old.